One of the nearly-last books on my Sci Fi Experience reading stack was Federation by Judith & Garfield Reeves-Stevens. This was a re-read, but it had been years and I’d forgotten most of the details…but I did remember it was a good one. The Reeves-Stevens also wrote one of my favorite Trek books, Prime Directive, and are absolutely brilliant at capturing characters. Federation takes a broad scope, with three storylines across times, which ultimately intertwine. We follow Zefram Cochrane, inventor of warp drive, through the early days of warp technology and into World War Three. In the 23rd century, Kirk is facing fire from Starfleet over a recent mission–the one in which they met a much older Cochrane (“Metamorphosis”), who asked to be kept secret. In the 24th century, Picard is hoping to obtain a piece of Borg technology that could be vital to the defense of the Federation. There’s a lot to juggle here, and this is a case where, as a writer, I can very much appreciate how well the Reeves-Stevens handled it. The divergent plots feel like they should be confusing, but aren’t; they ground us very well in each storyline, and a tight point of view helps a great deal too. We’re only ever in the points of view of Cochrane, Kirk or Picard, and move in regular sequence between the three. The Cochrane plotline provides a very interesting window into an earlier era of Trek history–even if it turns out not to be canon. This was written before First Contact, and there’s a very prescient author’s note remarking that later films might invalidate the ideas set out in the book. With all due appreciation for First Contact, I like the Reeves-Stevens’ version better. It feels more like possible history and less like an action film. Cochrane develops warp flight with financial backing from an idealistic billionaire (who I’m pretty sure is the long-lived Flint from “Requiem for Methuselah”), and is instrumental in founding early colonies. He gets tangled up with World War Three because one military leader believes that Cochrane holds the secret to the ultimate weapon, a so-called “warp bomb.” It’s exciting, while blending in philosophy, economics and galactic politics in a way that’s remarkably believable. Kirk’s plotline draws very closely from original series episodes. The plot points are mostly from “Metamorphosis,” but the timing is directly after “Journey to Babel,” with Ambassador Sarek still aboard at the beginning of the book. There’s a wonderful scene with Kirk, Spock and Sarek playing poker in Sickbay. I really enjoyed how much this was grounded in particular episodes. Most Trek books seem to take place vaguely “on the five-year mission” (maybe in the last year after the final episode). That’s fine as a rule, but tying it in so closely made me feel oddly nostalgic. The best thing about Trek are the characters, and I think I love the Reeves-Stevens so much because they know how to tell Kirk, Spock and McCoy. Trek books live and die for me based on whether Spock and McCoy snipe at each other–and they do here! It’s understated, but perfect. They go back and forth a few times, with Spock giving very precise estimates, McCoy rolling his eyes, and at least once Spock is deliberately vague, just to bait him. It’s excellent. The Picard plotline had its own mysteries and tensions, which is good since for most of the book it felt completely unrelated to the other two plots. It comes together in the end, and the authors try to tie it closer together with an Ambassador Sarek connection…but mostly I think the reader has to just take it on faith that the plotline is relevant and enjoy it for itself in the meantime. The way it ties together is ultimately a bit far-fetched…but personally I’m willing to just go with it. If I have any major criticism, it’s that the frame-story felt unnecessary. I see what they’re doing–it’s a thematic thing–but it didn’t work for me. The book starts with a prologue about a very depressed Kirk coming to the Guardian of Forever. The timing is right before Generations (which I’d prefer to IGNORE, if you don’t mind) and Kirk is having a premonition that his life is over and there’s no purpose anymore and etc. etc. The Reeves-Stevens are so good at portraying the characters, but this was odd…and just depressing. There’s a thematic point about the purpose of it all, and humanity’s journey and the exploration of that idea within the book is inspiring–but it doesn’t need the prologue to draw that out. So if you pick this up and the first few pages aren’t working for you…skip ’em. And after the first few pages, this is absolutely worth picking up. Watch “Journey to Babel” and “Metamorphosis” in preparation, and then I think you’ll thoroughly enjoy Federation! That’s all I found! Anyone else? Tell me about yours! Pucker Up…and Wake a Dead Guy? So nice to see your review of this re-read and remember my own great experiences with this book. I too am not a fan of First Contact in large part because this is a much stronger story involving Cochrane. This writing team is really fantastic and tell the very best Star Trek stories, in my opinion. It is obvious that they are skilled writers and that they do, as you say, have the characterizations down cold. 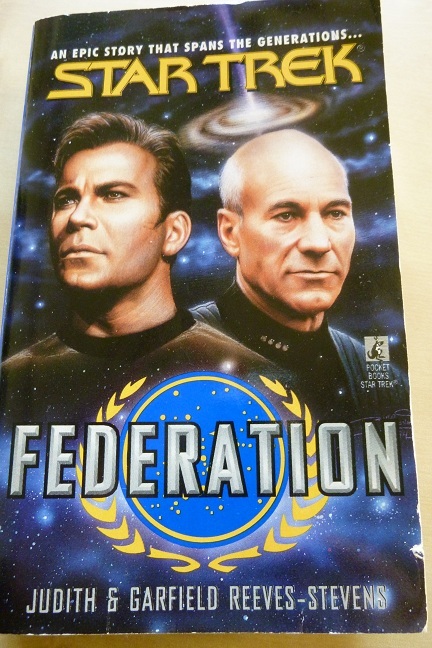 If I ever recommend Trek books it is always Prime Directive and Federation that I go to first. They are must-reads in my opinion. Years ago I bought the episodes that go along with this one so that I could watch them in conjunction with the reading.